I’m now doing some catchup after the christmas break. I had this request over the holiday and I’m ashamed to say I’m only getting round to it now, Sorry David. I think this request will be for the American readers. David I urge you to get in touch with FENA http://fergusontractors.org/fena/ they may be of more help. I would also suggest joining if you aren’t already a member. So can anyone help with David’s problem of locating a front end? Timlove your site and have looked at all the pages in search of more plow info. I was given a Ferruson DO-41-B Middle Buster with one plow blade. The pictures that I was able to find on the internet have two blades with a disk attachment to set depth . I am missing the blade tip that was made to be replaced and the bolt on Disk attachment and was wondering if you ever came across anyone selling the replacement tips for these type plows? I could send some pictures if you would like. Thanks forgetting in touch. Sounds very interesting. Please can you sent a few photo’s as I’m not 100% sure. I’ll post it on the site and see if anyone can help. Tim,Feel free to use the pictures as you wish with any luck someone in your group might know about these type middle busters. I held a tape that is in inches to the back of the blade and it is 24″ wide where the tip would bolt on is 12″ wide. Looking at the pictures on the internet of the two blade DO-41-B gives a good idea of what I would need to plow again, I noticed that there is a wheel option for the front but not sure if it was used to keep the blade from plowing to deep or cutting the sod so the blade would split the sod clean in the middle? I have found very little information on the internet about replacement parts and was hoping you had a source in the U.K. any help would be greatly appreciated. Happy Christmas one and all. I hope Santa brings you something nice. I recently organised a Christmas quiz for my local Ferguson Club meetings “Tractor Club” as I call it. I thought one or two of you might like to have a go and see how many you can get right. See if you can answer them WITHOUT looking up the answers. I’ll post the answers in the new year to give you some time. Last weekend the Family was in Durham at a 1st Birthday party. Why am I telling you this? We had to make a stop at Beamish Museum and as we where waiting in the staff car park I spotted a new barn being built. The barn wasn’t that interesting apart from thinking what Ferguson things you could put in it when it is finished. No, the contents were far more important. I know they have one ferguson tractor (the one behind) as I fitted a MIL loader to it. It looks as though there is a second and from the front and back wheels an early model. The pictures below were as close as I got (For now) a closer inspection and report when we are up there at some point over christmas. Seb would you like to comment, Beamish Transport Online, not really your thing but would you like to comment? Would you agree with that or not Ted, Roy? I got a bargain with these 5 Britool spanners for 99p Yes there are still bargains on ebay. They were local to me so I didn’t have to pay any postage. Description: Massey Ferguson Range Supplement Sales brochure covering the MF35 Loader, 17 Trailer, 18 Trailer, 702 Transport box, 701 Transport box, 723 Post hole digger, 721 Multi purpose blade, 727 Subsoiler, and 65 Rotary Cutter with pictures and spec on the machines dating back to 1966. I really pushed the boat out on this one. I just hope it’s worth it. I’ve only ever seen a photo and short video for the Ferguson training school. I’m desperate for any information I can get on the place. If I had a time machine it would be the place I would go an attend one of the courses. I have a question to which you may be able to give an answer. In the french parts book of the MF 837 trailer I found another type of T-bar for the pick-up hitch. The parts book says that there were various versions of the T-bar for the FF30, the 35, the 65 and the narrow versions. Do you know if these hitches were also sold in the UK? I only found some pictures on french internet sites, but nothing from England. I’ve attached a scan of the drawing of the T-bar. Do you know anything about these hitches? As I said in my email to you “this is a new one on me”. I find the diagram in the top right hand corned A, B, also intriguing. I just hope someone has some more information/Pictures of the item. I hitched up my TEF20 with mkII fergie trailer and found myself under the spout and pleased for my scottish aviation cab as i drove under! The tractor responded well – not getting stuck at all and managing to go faster than the forager when loading and went hitting the road 4th gear was a breeze! This is one of 6 of my tractors and has had full rebuild but kept in working clothes and regularly oiled down but now needs a good wash after ‘working’ yesterday! Tom thanks so much for sending in these pictures I find the second one breath taking. look at what 60 years of development can do, and Mr Ferguson said we would never need bigger tractors than a TE-20! Saturday 20th October 2012 is a day I will remember for a long time. I drove my tractor and plough to Norton Plough match. It’s about the closest event to me and as I don’t have a truck or trailer the closest to drive to. The weather was glorious as you will see from the photos. Being prepared I’d put on loads of clothes for the cold and waterproofs in the bag just in case. In the end I was taking jumpers off as it was too warm. I’ll be expanding this post but for now take a look at some of the pictures. A big thank you to Roy for standing around all day and taking the pictures. I was so busy there is no way I would have been able to do it. Where does the time go. it was only a 33ft wide plot. There were 15 in the Vintage hydraulic class 4, I came 10th. I am so pleased. I’m itching to have another go and learn from my mistakes. I think the new tyres may have helped with traction. Below is a picture of the tyres fitted to the hand painted rims waiting to be fitted to the tractor. I splashed out and went for Goodyears. I just think they look the best. I’d also like to thank my sister-in-law, Rhiannon for sending me this wonderful long (66ft) tape measure it came in very handy on the day. and it was made in Sheffield. I’m sure it made the difference. As you may or may not know I put myself forward to be the local (South Yorkshire & Derbyshire Area) Representative for The Ferguson Club. One of the things local members wanted was visits to local collections / places of interest. For the first visit I contacted Peter Bradley in Sheffield who has one of if not the best collection of Porsche tractors in the UK and one of the best in the world. He was an amazing host and had some great stories of how the tractors ended up in his collection and the restoration they needed to get them to the excellent standard they are all at today. Amongst the collection which Peter couldn’t pick out one as a favourite, might be the last remaining Coffee tractor a fully covered in machine all the way from Brazil. At the end of our time I presented Peter with a little bit of Ferguson as a token of our gratitude, A framed reprinted advert for the Ferguson system. which came from an original printing block I have. I have no intension of boring you with the detail as to why the website hasn’t been working for the last couple of weeks. We are back now, hurray. In some ways it has been a good thing as I have focused on the tractor for a change. A big thank you to the people at TSOHost.com for transferring the site seamlessly and all their help. I thought This first new post could be a competition. Any ideas as to what this item is and what it is used for? It was given to me by my uncle in law and it was left with a pile of other stuff by an old boy who had the allotment next to his. He thinks the tractor used was a ferguson. The famous bar, link, rod or whatever you like to call it! It’s 92″ (2340mm) between centres, and that’s a 3/4″ BSF (I think) bolt through the end of it. The holes are 0.825″ (21mm) diameter, and the bar itself is 1.7″ (43mm) diameter. Weighs ~6kg. Best suggestion I have had so far is a solid bar for towing, what do you think? Message: Would that bar happen to be part of a Ferguson sack lifter? The piece that acts as a top link. Reply: Thanks Michael, looking at the image you sent I don’t think it is. 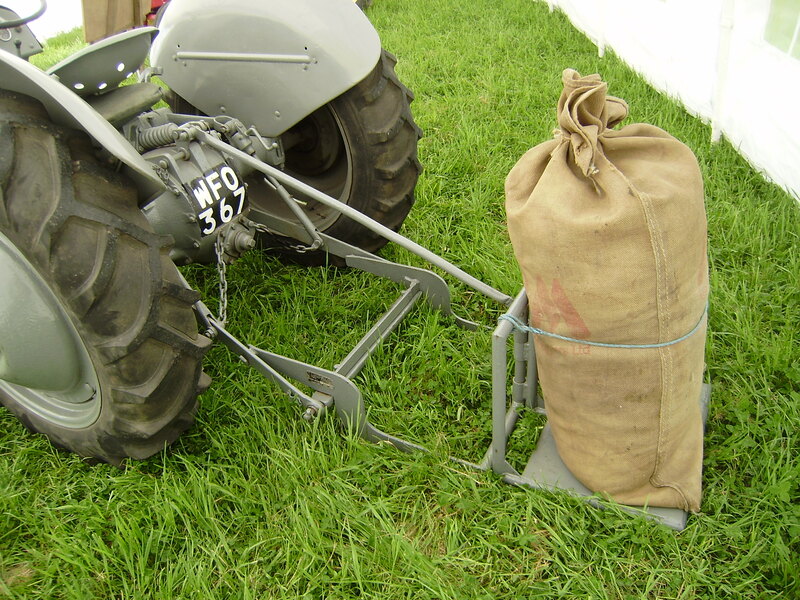 The sack lifter bar has been flattened at the ends and looks quite flimsy. The bar I have has cast brackets welded on at either end. My bar is 8ft long. Message: Suggest that this is the top link comnnection. From top link headstock to rear of a Ransomes mounted plough. Not to be entered in a competition! Reply: Thanks Paul, I have a friend who is into Ransomes I’ll ask him. any Idea on a model type? It is Blue in places as well.